Work is such a whirlwind. My husband picked me up at the train at 6:10 and told me he needed to go back to work to meet someone at 6:45, so he ate dinner standing up, helped me throw the kids in the tub and then I was left trying to wrestle down 2 raging lunatics to do homework and bedtime. I told them I was going to call a babysitter to help me if they didn't settle down and they stopped immediately. Not sure what terrible visions came into their mind with this threat, but I am not going to question it! I set the middle one up with crayons and a coloring book in the living room (he was "too scared" to stay in his room) and told him to stay put or the babysitter was coming. Then I settled with the big boy to do homework. Then I brought them up and set up the big boy with the kindle to play a game (desperate times call for desperate measures) so I could put the middle one to sleep. Once that was done I moved to the big boy who was in my room to get him to sleep. They all need to be individually snuggled to bed....they are spoiled! :) Except the baby who gets put in his crib with a bottle and calls it a night. Just finished cleaning up all the dinner mess. We had a great meal; easy and so tasty. Stir together mustards and maple syrup. Season with salt and pepper (I skipped this part). Drizzle some oil in a 9x13 baking dish. Add chicken, carrots, potatoes and shallots; drizzle with more oil. Bake until chicken is lightly golden and cooked through and vegetables are tender, about 35 minutes. I just went to a drawer where I keep my stamps, envelopes, etc. 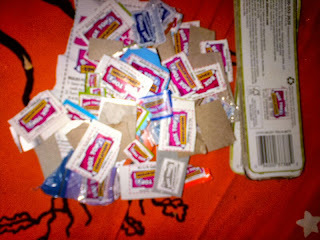 In there I have an envelope with all the box tops I collect for school. If you are a parent and have a school-aged kid you know all about the box top program so I won't go into detail, but top line is certain grocery items have a little rectangle with the box top logo on it. You clip it, give it to your school and it gets redeemed for money that the school can use for things they need. Schools can make quite a bit of funding through this, so it is worth the effort in my opinion. You can find them on a lot of items - I cut them off of Ziploc, cascadian farms cereal, etc. Get It Done Tip: As soon as I unload the groceries - whether it is from the food delivery service, target, walmart, or wherever I look at each item as I put it away. If I spot a box top I cut it off immediately and put it in the envelope. I have a nice little collection in hand now that I can send in with my son for his school once they start sending through the requests for them.